In his multi-hyphenate ambitions, the musician who calls himself Juiceboxxx couldn’t be more modern—you might call him a punk rock-rapper-DJ-record executive-energy drink-magnate. Journalist Leon Neyfakh has been something more than a fan of Juiceboxxx’s since he was a teenager, when he booked a show for the artist in a church basement in his hometown of Oak Park, Illinois. Juiceboxxx went on to the tireless, lonely, possibly hopeless pursuit of success on his own terms—no club was too dank, no futon too grubby, if it helped him get to the next, next level. And, for years, Neyfakh remained haunted from afar: was art really worth all the sacrifices? If it was, how did you know you’d made it? And what was the difference, anyway, between a person like Juiceboxxx—who devoted his life to being an artist—and a person like Neyfakh, who elected instead to pursue a stable career and a comfortable, middle-class existence? 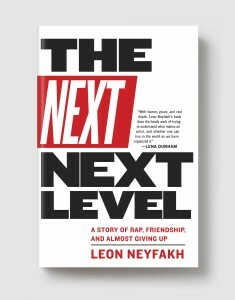 Much more than a brilliant portrait of a charismatic musician always on the verge of something big, The Next Next Level is a wholly contemporary story of art, obsession, fame, ambition, and friendship—as well as viral videos, rap-rock, and the particulars of life on the margins of culture. LEON NEYFAKH is a reporter for Slate. He was previously the Ideas staff writer for the Boston Globe and a reporter for the New York Observer. He has written for The FADER, the New Republic, Rollingstone.com, NewYorker.com, and a number of other publications. Born in the Soviet Union, Neyfakh was raised in Oak Park, IL, and now lives in Brooklyn.